Kody is a recent graduate from Northern Arizona University’s W.A. Franke College of Business with a Bachelor of Science in Finance. During his studies, alongside his peers and mentors, he worked through managing portfolios focused on accumulating wealth and maximizing portfolio income. Additionally, he was able to work with professors who were backed by many years of experience and have the true desire to help their students be prepared for taking on the roles of being a wealth advisor. In the Summer of 2015 he was able to place himself as an intern in our office. After graduation in May of 2016, he decided that our team was where he wanted to call home. 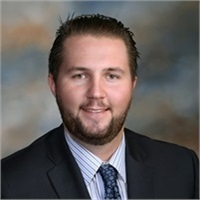 Kody has been working with the senior advisors learning how to assist clients, families, and business with their positioning their assets to maximize wealth, income, and assets. He has been an outstanding asset to our firm and is truly focused on learning all he can about developing personal financial strategies that focus on accumulating client wealth. He currently holds his Series 7, Series 66, and Life & Health Producer’s license. He has been working on his next goal which is to attain the Certified Financial Planner’s certificate, which will help him understand the true holistic meaning behind individual, family, business, and estate planning. Kody is the son of senior advisor Kory Budinger, learning to follow the footsteps of his father has been an accomplishment he has wanted for as long as he can remember. Kody and his wife Morgan live in Chandler, AZ with their Yellow Labrador named Daisy. He enjoys spending time with his family and friends and spending as much time as he can in the beautiful outdoors that Arizona offers.